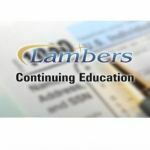 Duties, Restrictions, Sanctions and Penalties – Lambers, Inc. This 3 Credit Hour Course covers accuracy, various tax codes from Circular 230, sanctions for violating regulations, penalties and disciplinary proceedings. This online video course is taught by Professor Arthur Reed, MBA, CPA, MST and awards 3 credit hours under the Federal Tax Category.